Russian art collector Alexander Ivanov explains how the Russian Art Market may develop as the ruble and economy plunge. The last big sales in London in November reflected the deepening crisis in Russia. Major auction houses failed to sell between 40 and 60pc of lots offered. Although a new record was set when Valentin Serov’s Portrait of Maria Zetlin sold for £9.2 million, well above its £1.5-2.5 million estimate, even that could not hide the lacklustre atmosphere. Ivanov bought the egg at Christie’s in 2007, though no public announcement of his donation has been made. 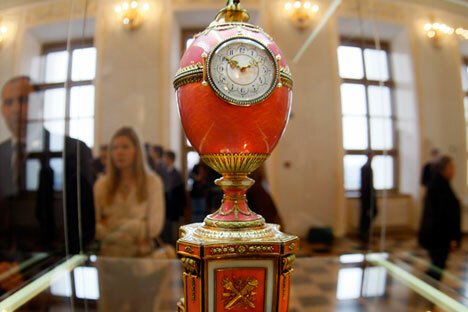 As the collector told Moskovsky Komsomolets, it was always obvious that such a masterpiece as Rothschild’s egg must end up in Russia. He won't acknowledge his own role, remarking: “I don’t need PR." Ivanov talked with RBTH during a recent shopping spree in London. A.I. : I always go to the National Gallery and its gallery where Carlo Crivelli is displayed as well the one that has Da Vinci. It’s a pity Crivelli doesn’t appear on the market very often. As for Da Vinci, they do occasionally - I just arranged to acquire a couple. But proving that it is an actual Da Vinci is incredibly difficult. RBTH: How do you think Russian Art Market is going to evolve? Is Putin really "watching closely who is throwing money around in London," as one British journalist told me? A.I. : Putin has too many other problems to deal with. It’s a well-known fact that Russian bureaucrats spend colossal amounts of money at London auctions. But these people have no taste or education; they buy “primitive” art like Breughel, or some Russian art, lubok for example (Russian popular prints)which they bid sky high. Even the Serov is hardly a masterpiece. Everyone understands that, apart from a Russian bureaucrat who knows and understands nothing. The reason why there are fewer of these buyers now is because the FSB [Federal Security Service, a successor body to the Soviet-era KGB] is investigating a couple of smuggling cases involving antique dealers and high-level Russian officials. It is a new trend, and I am sure there will be more checks, hence all the dealers are getting a bit nervous.